Giants of the Ocean. Air breathing mammals that spend all of their time in water. Producers of a great variety of sounds and songs. Mysteries to researchers. 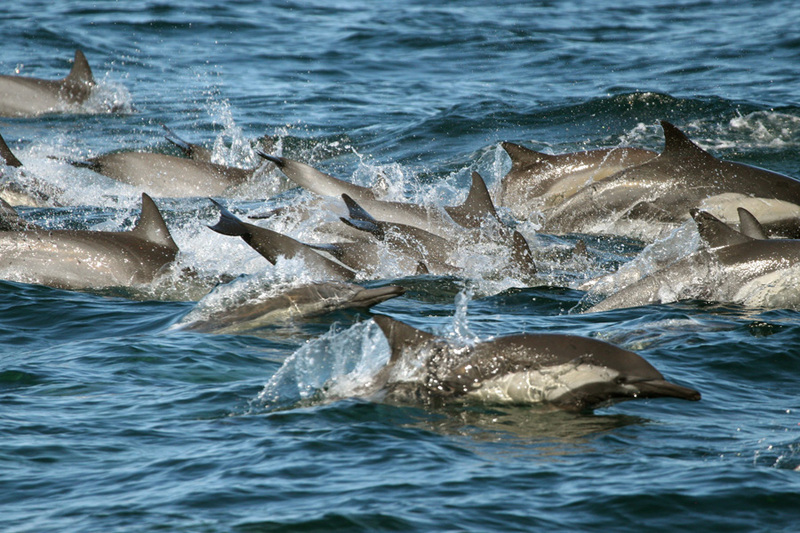 Cetaceans is the collective name for all whales, dolphins and porpoises and they are a fascinating bunch. The scientific order in which they all belong is called Cetacea. There are around 87 different species altogether divided into 14 families and the two suborders: toothed whales (Odontoceti) and baleen whales (Mysticeti). While cetaceans may look like fish and live in water like fish do, they are not fish. Fish produce eggs, sometimes thousands at a time, and do not develop strong bonds between mother and child. Cetaceans in contrast are mammals that give birth, usually to a single calf after several months of pregnancy. The bond between mother and child is very strong and comparable with human experience. Fish breathe oxygen with their gills and suffocate if they spend too much time out of the water. Cetaceans have lungs like humans and need to rise to the surface to breathe, or they would otherwise drown. Fish are cold-blooded and cetaceans warm-blooded. Cetaceans keep warm with the help of high levels of bodyfat and a thick layer of blubber. Fish have vertical tails that move from side to side in order for them to move forward in the water. Cetaceans have horizontal tails, or flukes, that move up and down. They also have bones in their fins that resemble the limbs of land animals. This is because they were once land animals. Pilot whales are actually dolphins and not whales. But dolphins are also whales… Confusing, isn’t it? Let’s get a clearer picture. Pilot whales are toothed whales that belong to the Delphinidae family and are the second largest Oceanic dolphins. The killer whale being the largest. What all this means is basically that pilot whales are animals (Animalia) first and foremost. They are animals with certain physical attributes, like a spinal cord (Chordata), backbones (Vertebrata) and a jaw (Gnathostomata). Contrary to fish, pilot whales are mammals (Mammalia). More precisely, marine mammals (Cetacea) with teeth (Odontoceti) belonging to the dolphin family (Delphinidae). 1) The long-finned pilot whale is called Globicephala Melas. Melas is the Greek word for black. 2) The short-finned pilot whale is called Globicephala Macrorhynchus. Macrorhynchus comes frоm the Greek words macro, which means enlarged аnd rhynchus, that means snout оr beak. The pilot whale was scientifically classified by Scottish physician Thomas Stewart Traill around the Orkney, Shetland, and Faroe Islands in 1809. He called the whale Delphinus melas. The name was later changed to Globicephala melas. 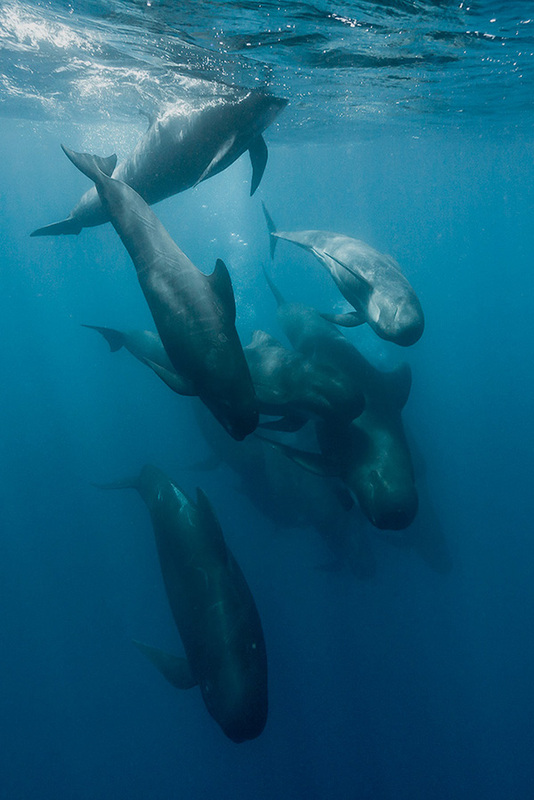 The name ‘pilot whale’ originates from the belief that every pod has a leader or a ‘pilot’ that leads the group. This is not far from the truth when you consider how whole pods sometimes strand themselves or end up in drive hunts. The vast majority of cetacean species are toothed whales (Odontoceti), including the pilot whale. They have teeth which they use not for chewing, but for catching and tearing apart their prey. If they don’t just swallow it whole, that is. They eat fish, squid and sometimes other marine mammals. 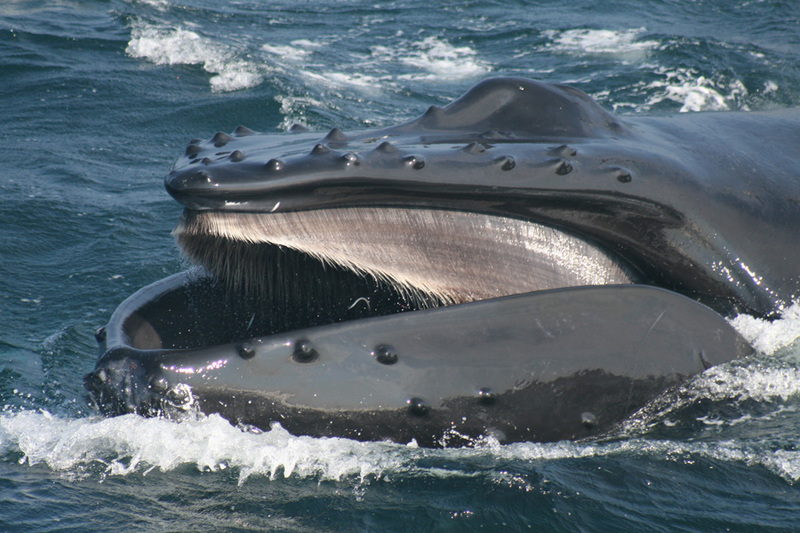 Some whales however, like the sperm whale, use their teeth less for eating and more for showing dominance or aggression. There is some confusion about exactly how many different species of toothed whales exist and new species are still being discovered. But roughly there are 73 species altogether. Within the Odontoceti suborder there are four different families of whales: narwhal and beluga whales (Monodontidae), sperm whales (Physeteridae), dwarf and pygmy sperm whales (Kogiidae), and beaked whales (Ziphiidae) – as well as all dolphins (Delphinidae), river dolphins (Platanistoidea) and porpoises (Phocoenidae). River dolphins live in freshwater rivers, except for the La Plata dolphins that live in saltwater. Due to overfishing and pollution all five living species of river dolphins are threatened to extinction. A sixth species, the Yangtze River dolphin, has only recently gone extinct. While porpoises look like small dolphins, they are in some ways quite different. They are shy animals that live in small groups. Their teeth are flat and spade-shaped and not conical like dolphin teeth. Porpoises are generally smaller and more compact and their dorsal fin is more triangular than the curved fin of dolphins. 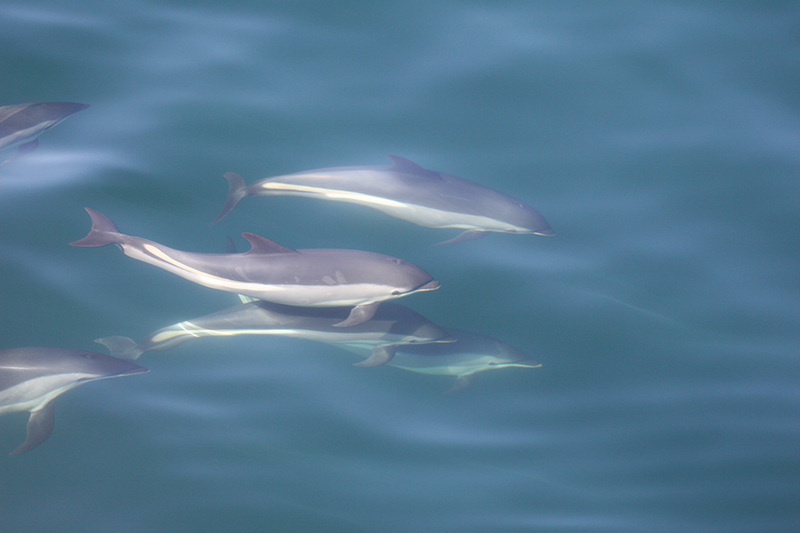 Finless species of both dolphins and porpoises exist. What a remarkable sight that is! Baleen whales (Mysticeti) are also called the ‘great whales’. Some of the largest animals on the planet are baleen whales. They are solitary animals that travel thousands of kilometers every year. 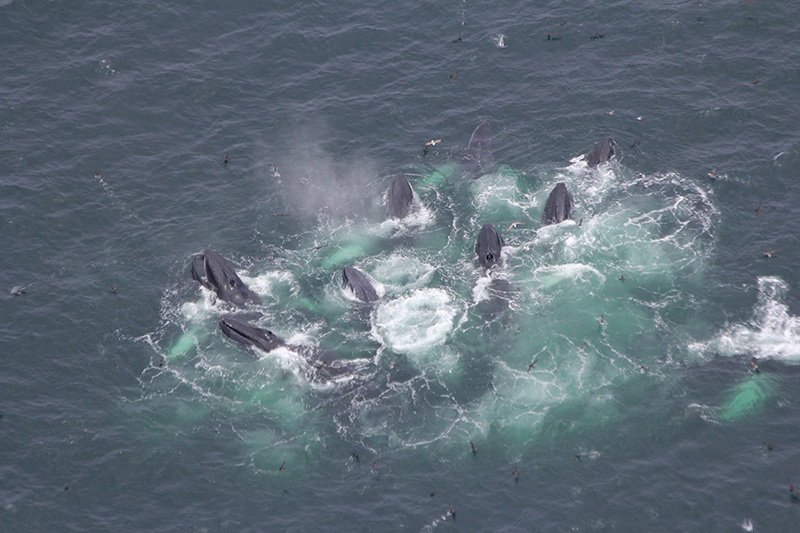 A distinctive feature of these whales is their blowholes. While toothed whales have one blowhole, baleen whales have two! This creates a V-shaped blow. Instead of teeth these whales have baleen plates to filter their food, which is made up of lots and lots of plankton, crustaceans and small fish. The largest whale, the blue whale, eats 4 tonnes of krill every day. You would think that the drastic decrease in whale populations caused by whaling would result in an increase in krill numbers, but the opposite is the case. Check out the poop story to understand why. Baleen is made out of the protein keratin, the same as our fingernails and hair. 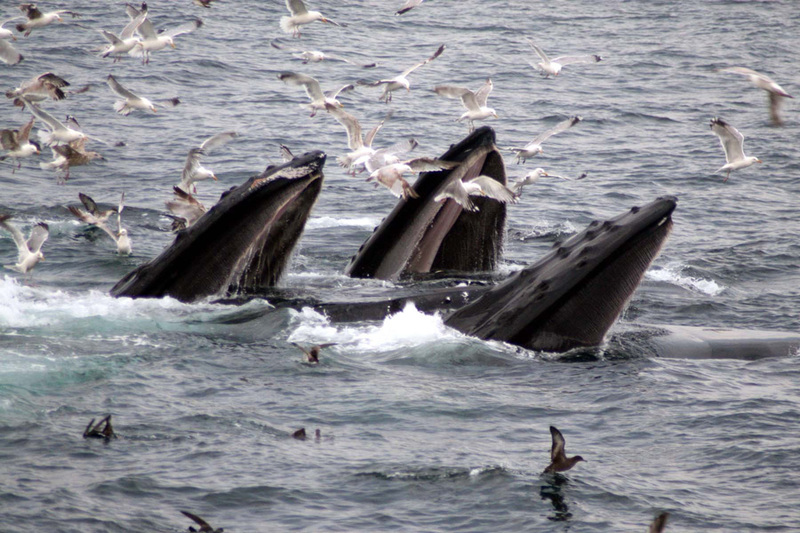 They have around 600 baleen plates in their upper jaw with hair that ensure that the food is separated from the water. Like humans, whales cannot drink saltwater. 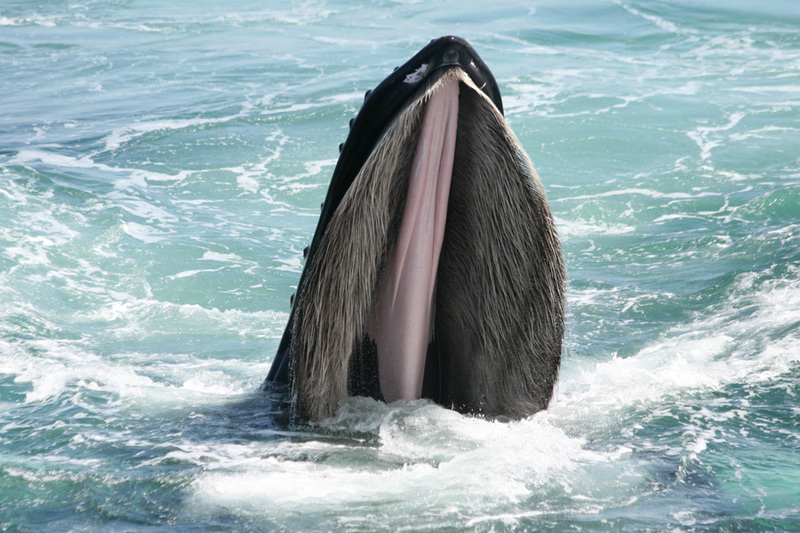 Generally baleen whales are larger than toothed whales. The sperm whale being an exception, as it is the largest toothed whale and larger than the smallest baleen whale, the minke whale. Surprisingly perhaps, the females tend to be slightly larger than the males. 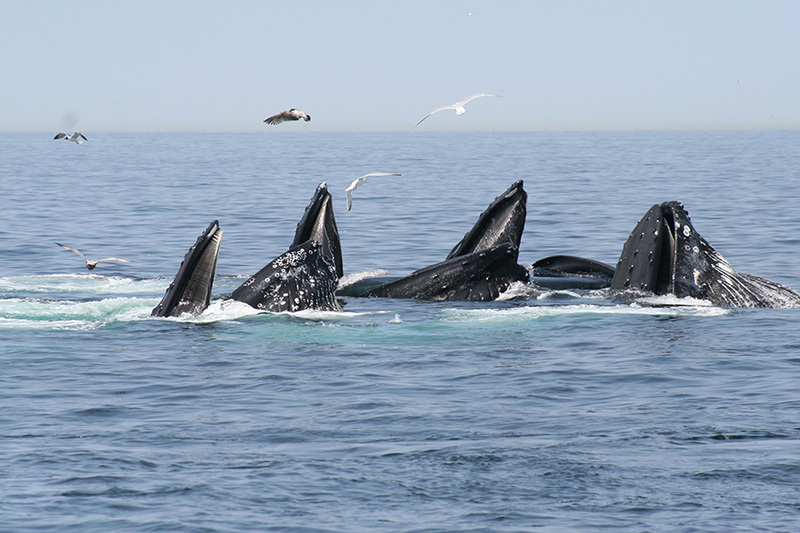 There are 14 different species of baleen whales within the four families: right whales (Balaenidae), rorquals (Balaenopteridae), grey whales (Eschrichtiidae) and pygmy right whales (Neobalaenidae). The largest whale is the blue whale (Balaenoptera musculus). The blue whale is also the largest animal to have ever existed on this planet, as far as we know. It weighs up to 200 tonnes, which is more than 30 elephants, and is around 30 meters long. Their blow can be up to 12 meters high. Especially young blue whales have been seen to breach. Can you imagine the splash? Blue whales usually travel alone or in pairs. During winter most of the whales are in warmer, tropical waters where they breed and give birth. Then in summertime they migrate to cooler, polar environments to feed. The song of the blue whale is deep and loud and at times lower in frequency than what the human ear can perceive. They make sounds louder than any other creature on the planet and can hear each other while being more than 1,000 kilometers apart. Sadly, because of whaling up until the ban in 1966 the blue whale is nearly extinct. In the Antarctic, where the largest population of blue whales existed, the population was reduced to 0.15 percent of the initial numbers. Today’s population is thought to be somewhere between 10,000 and 25,000 individuals. The population is seemingly slowly increasing, so there is hope for the survival of this magnificent species. Cetaceans live in a world of sound. The conditions are often murky and with the need to dive into dark depths for prey and find each other at great distances, cetaceans depend on sound for survival. Besides river dolphins who are practically blind, whales have good eyesight both above and below water. But what is eyesight good for when there is not much to see? Adapted to dim and low-light conditions, toothed whales have developed the ability to echolocate. They use echolocation, also called biosonar, to navigate the oceans and to find prey. The whale emits sound waves, often in the form of low-frequency clicks, that hit an object or another creature and then echoes back to the whale. This makes the whale able to determine the shape, direction, distance, speed and texture of the object in target. The sound is produced in the melon, which is a fatty organ in the head. Since whales do not have ears on the outside of their body, they receive the sound through fatty structures in the lower jaw bone. Baleen whales are not able to echolocate like toothed whales. They don’t have as much need for it, since they feed by simply opening their mouths and let all that krill or fish in. But sound is extremely important to them for communication purposes. It is with loud calls they find mates, pals and family from great distances. Cetacean sounds are a mix of clicks, whistles, moans, grunts and squeaks as well as percussive sounds made with their tail or fins to communicate a variety of messages. It is still unknown how exactly baleen whales produce their sounds, since they have no vocal chords. Nonetheless, they are able to create beautiful songs that are both fascinating and pleasing to the human ear.